Crops: Alfalfa is harvested as hay or silage which is processed or fed directly to livestock. Alfalfa is an important source of leaf meal used for fortifying baby food and other special diet foods prepared for human use. Large quantities of dehydrated alfalfa are also used in manufacturing concentrated feeds for poultry and livestock. Livestock: This plant is grown by itself or in combination with grasses in improved pastures. It is grazed by all types of domestic livestock. Caution should be taken when using alfalfa for grazing due to its potential bloat hazard. Wildlife: Alfalfa is an excellent food for antelope, deer, elk, Canada geese, sage grouse and sharp tail grouse. It is fair food for sandhill cranes, mallards, hungarian partridge, and pheasants. Medicago sativa L. alfalfa, is a long-lived perennial legume. Flowers vary in color from purple to yellow and are borne in loose clusters. Pods of alfalfa range from the sickle type to those that are twisted into spirals. Each pod contains several small kidney-shaped seeds. Alfalfa stems are erect and grow from a woody crown to about 2 to 3 feet tall. New growth occurs from buds in the crown. The plant has a tap root which may penetrate 25 feet deep into the soil. Compound leaves are alternately arranged on the stem and are normally trifoliate although there are commercial varieties that have multifoliate leaves. There are approximately 227,000 seeds/pound. Alfalfa grows best on deep, well-drained, friable soils. 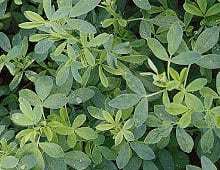 Lands subject to frequent overflows or high water tables are unfavorable to alfalfa. The pH of the soil should be 6.5 or above. Alfalfa is distributed throughout the United States and Canada. A seedbed must be smooth, firm, free of weeds and trash, and contain adequate moisture for germination and emergence. Land grading must be sufficient to ensure good surface drainage. Alfalfa should not be seeded as a first crop on newly leveled land where fill may settle and cause poor surface drainage. 15-20 pounds of inoculated seed per acre evenly drilled 1⁄4” deep on adapted, properly prepared sites will produce adequate stands. A combination drill and packer is desirable. Cultipacking soil before and after seeding is helpful to establishing stand. Seeding depth should be no greater than 1⁄4” on finer textured soils and no greater than 1⁄2” on sandy soils. Spring seedings can be made 30 days before the average date of the last killing frost. Alfalfa seeding can also be made during the late summer. In general, graze or cut for hay when alfalfa is in early bloom. Graze or cut to about a 2” height. Successive cuttings for hay should occur at 1⁄4 bloom stage. Alfalfa can best withstand grazing if rotated frequently or grazed in small strips. The last cutting of alfalfa should be made 3 to 4 weeks before the first killing frost date. Alfalfa may cause livestock to bloat. Care should be used in managing such grazing to reduce the possibility of this hazard.